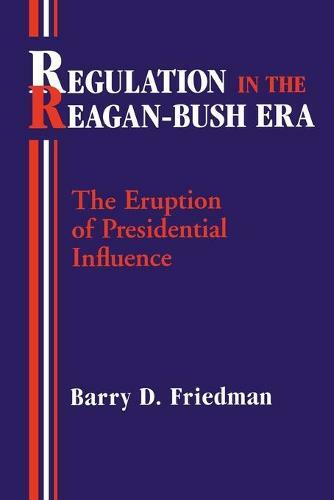 This timely and well-researched study describes for the first tim ethe astonishing acquiecence of executive agency officials, members of Congress, and federal judges to Ronald Regan's assertion of extraordinary new presidential power over the federal regulatory process--the controversial Executive Order 12291. From Harry Truman through Jimy Carter, chief executives complained that federal bureaucrats disregarded their policy preferences. presidential influence over regulatory rule making was limited: congressional committees and interest groups commanded more attention. Then in February 1981 Ronal regan abruptly departed from tradition by ordering that regulatory agencies must submit proposed guidelines for Office of Management and Budget approval. Barry D. friedman describes how the executive agencies and Congress responded warily and with skepticism, yet allowed the changes to remain; the judiciary was also willing to retreat from time-honored precedents that had preserved agency prerogative and now accorded due respect to the revolutionary Regan reform initiatives. Institutions that competed for leverage in the system continued to exercise restraint in their mutual relations because they recognized taht all benefitted from the others' viability. This book shows that conventional political science theories and models are now obsolete because of the eruption of presidential control into bureaucratic affairs. new review procedures have restructured relations between the president and the agencies and among the government's three branches. because of Regan's radical initiative, President Bill Clinton and his successors will sit at the bargaining table when regulation policy is developed in Washington, and political theorists will have to work from a new conception of presidential prerogative.